This month’s November 2012 issue of Toronto LIfe Magazine tried to make the case for making wearing bike helmets the law. The compairison was made that driving your car without a seatbelt is ludicrous and has been made law. Then why not mandate riding your bike while wearing a helmet? Both save lives. Both make complete sense. I couldn’t agree more with Toronto Life. The article isn’t yet available online, but if you pick up the November 2012 edition of Toronto Life, you can read all about it. Pretty interesting article for cyclists and for personal injury lawyers alike. Bike helmets save lives, particularly in busy urban centres such as Toronto where cars, pedestrians and bikes all compete for precious road space. Bike helmets prevent brain injury. They prevent catastrophic injuries. In a report prepared by Ontario’s Deputy Chief Coroner, Dan Cass reviewed the number of cycling fatalities from 2005-2009. In that report, Mr. Cass found that 73% of those bike fatalities involved cyclists who were NOT wearing helmets. That’s a staggering number. Mr. Cass then went on to call for mandatory helmets for all cyclists across Ontario. Mr. Cass’ recommendations have yet to be followed by Ontario’s government. I have no idea why. Perhaps it’s policing the issue to bike safety on city streets, like in Toronto. Can you really see a Toronto Police officer pulling over a cyclist on Jarvis Street or on Yonge Street and fining that cyclist $50 or $100 for not wearing a helmet. Talk about a waster of Toronto Police Resources, which are already scarce according to Toronto Chief of Police Bill Blair. Another reason why Ontario’s government hasn’t passed such a law is that cyclists want the freedom to ride how they want to ride. Cyclists tell me all the time, I ride a bike for freedom of travel and ease of travel. They don’t want to be hampered down by the rules of the road or the expense and hassle associated with having to wear a helmet. This argument carries little to no weight for this Toronto Personal Injury Lawyer, particularly when lives are at stake. 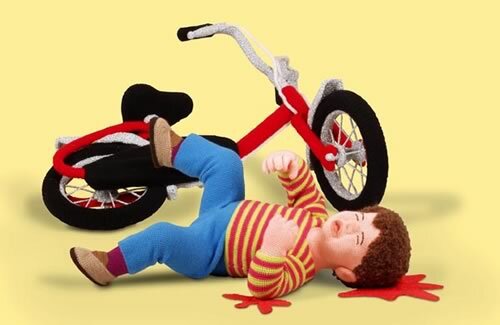 At the end of the day, when a Subaru Sedan runs a Shwinn Retro Bike off the road, who do you think is going to get the brunt of the injury; the driver of the Subaru or the cyclist riding the retro Schwinn. My money is on the Subaru driver any day, and I’m not even very partial to Subaru cars. The Toronto Life article had lots of other great stats relating to bike accidents. It mentioned that Toronto’s morning rush hour traffic has increased by nearly 20% from 1991 to 2006, making Toronto’s road more congested, more difficult to navigate, and more prone to car or bike accidents. Let’s face it. The more vehicles on our roads (either car of bike), the great the chance for a car accident. Good for business yes. But bad for safety as well. The 2006 census showed that over 24,000 Toronto residents commuted to work on their bikes. That’s a lot of cyclists, and a huge increase from years past. Bikes are a great option to get to work since they quick, easy to park and able to navigate more congested streets better than cars. They also don’t pollute the environment which is an added bonus. But bike safety must be paramount, and if our government is ignoring the issue of bike safety, in particular requiring cyclists to wear bike helmets, then they’re ignoring a big issue. Ask any emerg doc at one of Toronto’s downtown hospitals and they will all tell you the same thing. Bike helmets save lives and prevent brain injury. End of story. I would be remiss if I didn’t share with you my thoughts on the Canadian Men’s National Soccer Team and their World Cup Qualifyer against Honduras. All they had to do was tie, and they’d advance to the next stage of World Cup Qualifying. It was the biggest soccer match for a Canadian Men’s National Team in over 25 years. They end up losing 8-1 in embarrassing fasion. ESPN Desportes was ridiculing the Canadian performance after the game. That demoralizing loss set back Canadian Mens Soccer about 20 years. Way to destroy the beautiful game guys. No love for you from this law firm. You’re off our support list.